Simple ideas and tips to help you present homemade and purchased gifts with panache and creative flair. Mix and match the following ideas, or add variations of your own. Gifts can be store bought or homemade. Some have sentimental value shared by the giver to the recipient, while others mirror a person’s interests, likes and preferences. A package that is thoughtfully wrapped and presented or placed under a tree will share delight even before it is opened. Boxes come in all shapes and sizes. Many can now be purchased in a rainbow of colors. If you purchase or have a solid color box, cut out patterns such as snowmen, snowflakes, or other designs and line the box with tissue paper that is in contrast to the color of the box. This way the cut-outs will be shown with the hint of the tissue paper just behind. Use an X-Acto knife for best results – available at any hardware or craft store. Also remember that if you can’t find tissue paper in the exact color you are searching for, layering the paper will increase the depth and magnitude of the shade that you are trying to achieve. Too dark – remove a tissue or two; too light – add more. To add a special touch to your package or gift tags, choose a design that has features you can outline with a glitter pen. Then the sparkle and shine will add so much to the gift. Raffia has been a staple accent for packages in the last few years. Cut 6″ pieces and bundle in the middle with a twist tie. Make several of these bundles for a more pronounced showing; fluff out; and attach to the package with a glue gun. You can attach a small felt ornament to one of the strands or a jingle bell. Monochromatic themes, such as gold and yellow tones in the gift shown at left, are classic and elegant. Strong single colors, offset by white, are dramatic and very effective, as shown by the red and white example in the photo at right. Wallpaper also makes a nice gift-wrapping material if you can find some really interesting designs. Using those metallic star stickers that we are all familiar with and a plain index card, create a Christmas tree, wreath, or star and use as an attractive gift tag. Creating your own gift-wrap from plain white paper and embellishing with designs can be an afternoon of fun for the whole family. Even simple polka dots can look highly effective, and all you need do is dip a pencil eraser in a little paint, then print dots haphazardly over paper. Use light-weight felt or fleece and tie with yarn – add cut out snowflakes or other designs. A light-weight towel (bath or kitchen) adds a special second gift. 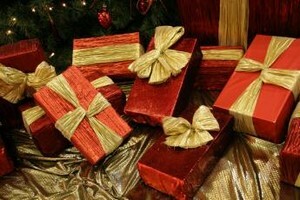 Christmas material can also be purchased by the yard to use as wrapping paper. Drapery tassels can be used to “tie” up a gift and give it a “Victorian” feel; embellished with bows and tassels, even a plain book becomes a thing of beauty. Paper doilies over solid color gift wrap gives a package a “delicate” feel. A very large gift in a very large carton – spray paint the box (removing the gift first), and then replace the item. Add some features such as stencils or other effects and no paper is needed. Tie with festive cord and you are ready to go. Undoubtedly, there is no end to creative gift wrapping possibilities. 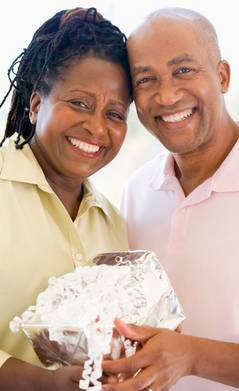 However, the most important gift is your love and your time, encapsulated in homemade wrappings, cards and tags that give joy before a gift is even opened.